Beinn Mheadhoin is an unusual mountain with its gently rounded summit plateau dominated by tors (rock outcrops) one of which is the summit. 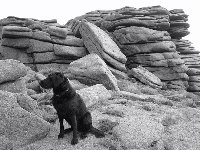 The N face of the summit tor is easily climbed. 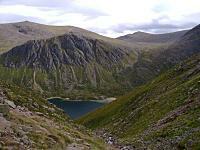 The E slopes to the Lairig an Laoigh are steep with some rock crags, but routes can be found there. There are steep slopes and crags to the S, especially Stob Coire Etchachan, and crags to the W at Stacan Dubha, otherwise the slopes are moderate with grass and some heather lower down. Beinn Mheadhoin is surrounded by a network of paths allowing it to be included in many routes. High Plateau, summit may be difficult to locate. Looking towards Beinn Mheadhoin over Loch Avon from Coire Raibert. 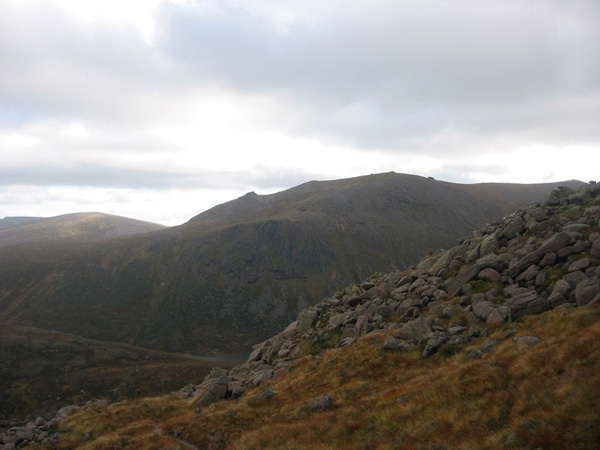 The summary information of one or more ascent routes that include Beinn Mheadhoin. 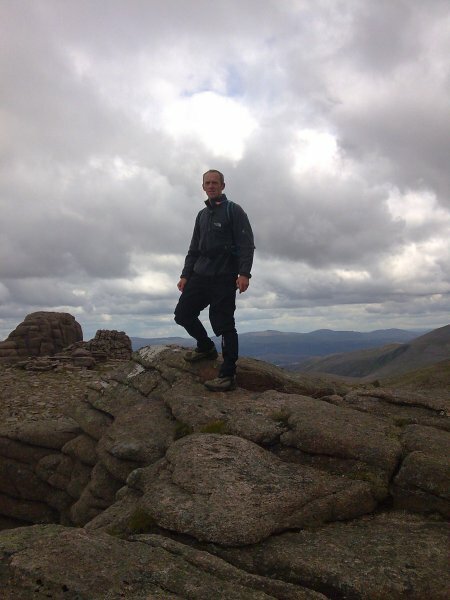 1 1215 m 32.77 km 9 hrs Beinn Mheadhoin This is a long route requiring endurance, but the ascent is not technically difficult. The summit is a rocky "torr" but this is not difficult to climb. The route time can be shortened by cycling into Glen Derry. 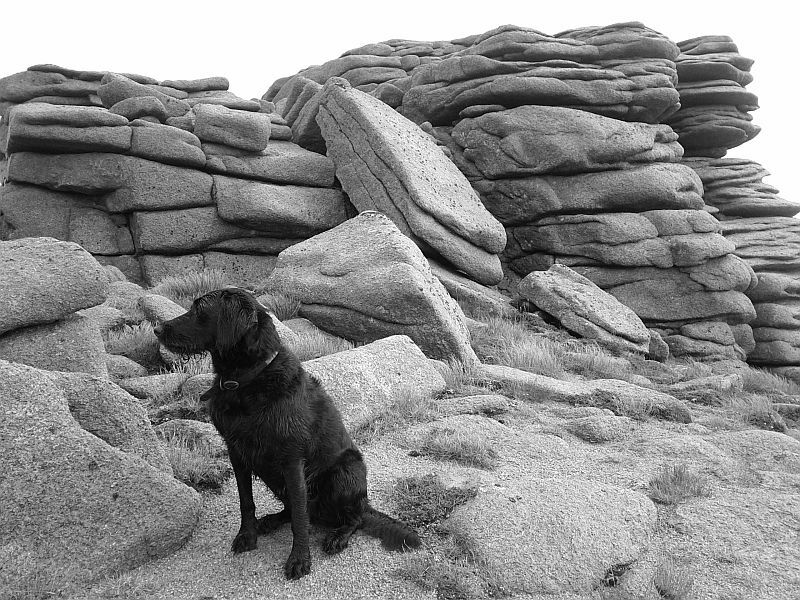 Jorja at one of the tors near the summit of Beinn Mheadhoin - she ran up the summit one quite the thing, btw! September 2011. On top of Ben Mheadhoin. Post a few words about Beinn Mheadhoin or read what others have had to say. 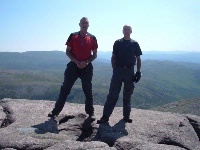 Climbed from Cairn Gorm car park, via Fiacaill buttress and Coire Dhomain. The rivers were in spate from snow melt, and crossing them was difficult. The 1:25,000 Cairngorms map has a footbridge marked at the entrance to Loch Avon. It does not exist, and there is no sign that it ever existed - be prepared to wade! It is a hard day but a great route, with changing scenery and varied terrain. 7th October 2007. We walked from Linn of Dee via Derry Lodge and Loch Etchachan, returning the same way. We thought about the MM ascent from Lairig an Laoigh but rejected it in favour of the good path on the other route. The dry weather allowed maximum use of friction on the summit rock. We took just over nine hours. I climbed this mountain in March 2000. 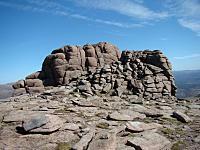 The route avoids the skiing paraphenalia of Cairngorm and the steep descent into & out of Avon. I started from Glenmore Lodge, and went via Bynack Stable and the Lairig an Laoigh to the Fords of Avon Bothy, crossed the out flow from Loch Avon then started the ascent to the summit which is very steep at first, and then eases. I found the summit tor tricky as it had been snowing quite heavily. I returned by the same way. It is probably better to return by The Saddle as it involves only a short ascent. This is a long day, about 12 hours, but a good one! After climbing from Coire Cas to Cairn Gorm summit, down through Coire Raibert and then ascending Southern ridge to the summit on the 'standard route', didn't want to lose height so continued to Derry Cairngorm, back over Ben Macdui and the tourist route back to Cairngorm. A long route, but one that means the pull back from Loch Avon into Coire Raibert was avoided. I climbed this with my wife Gill in Aug 2004. 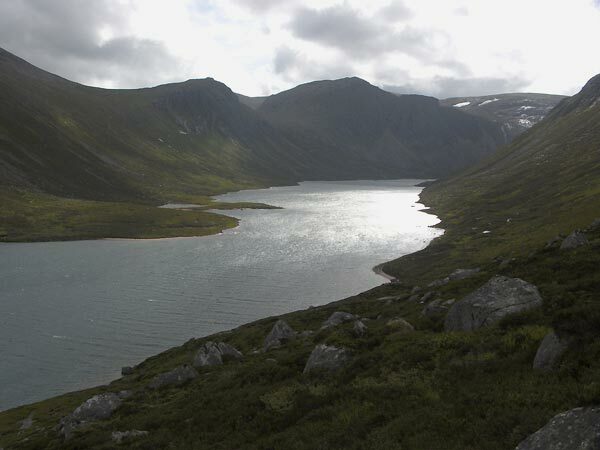 Started up Fiacaill a Coire Cas at 9 am - good warm up, fantastic views to Mheadhoin, Macdui and beyond at top - then horrid steep descent of Coire Raibert, wet feet at Loch Avon, lunch at Shelter Stone, steady climb to Loch Etchachan, then over open ground, with no real path, to top of Beinn Mheadhoin 2.30 pm. Fun scramble to top of tors. Steep descent, again no path, to outlet of Loch Avon, very wet feet (boots off) and up to Saddle 5 pm. Couldn't face reascending Cairngorm so walked out via Strath Nethy - back at Glenmore Lodge 9 pm. Great day!